I make rugelach every year for the holidays and every year I try to come up with a new flavor profile. Last year I did chocolate hazelnut which was really nice. This year I wanted a subtle herbal note and an altogether different jam I was kind of stuck on apricot. I thought that buttered walnuts and rosemary would make a nice combination and I made some spiced plum jam this summer, the combination sounded really good to me so I gave it a go. The walnuts have a very subtle rosemary taste (I am not a huge fan of strong rosemary) and the plum jam with gently spicing was wonderful with the walnuts. The crust is my standard cream cheese rugelach recipe, it never fails. Pre heat oven to 350. place parchment sheet on small sheet pan. Mix walnuts, melted butter and rosemary in mixing bowl, pour onto sheet pan and roast for 15-20 minutes, they are done when you can smell the nuts. Remove from oven and let cool. Chop walnuts and add brown sugar, mix together. Remove one of the dough quarters from the refrigerator, roll into a circle on floured work surface. I use the lid of my dutch oven to cut an even circle. 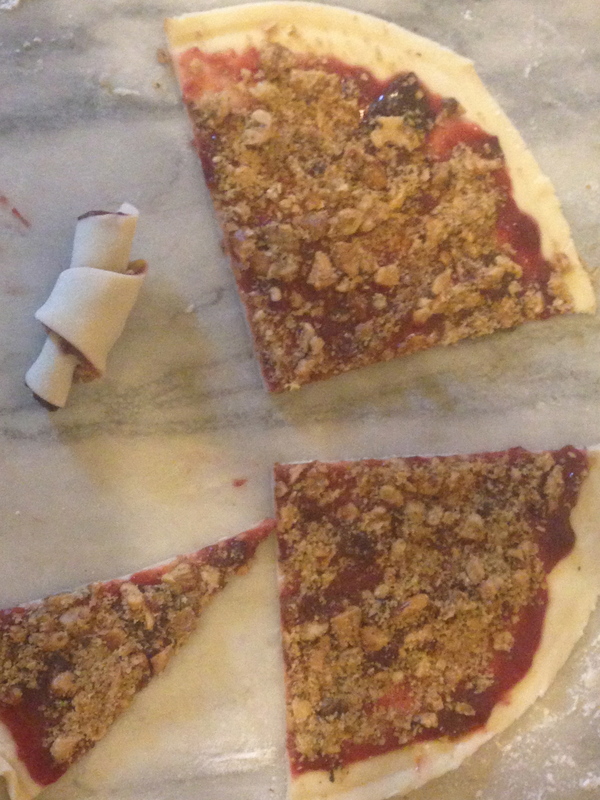 Spread jam on the dough round, sprinkle nut/sugar mixture on top of the jam and press down gently with your hand. Cut into quarters and cut each quarter into 3 pieces. Roll from widest end to smallest. 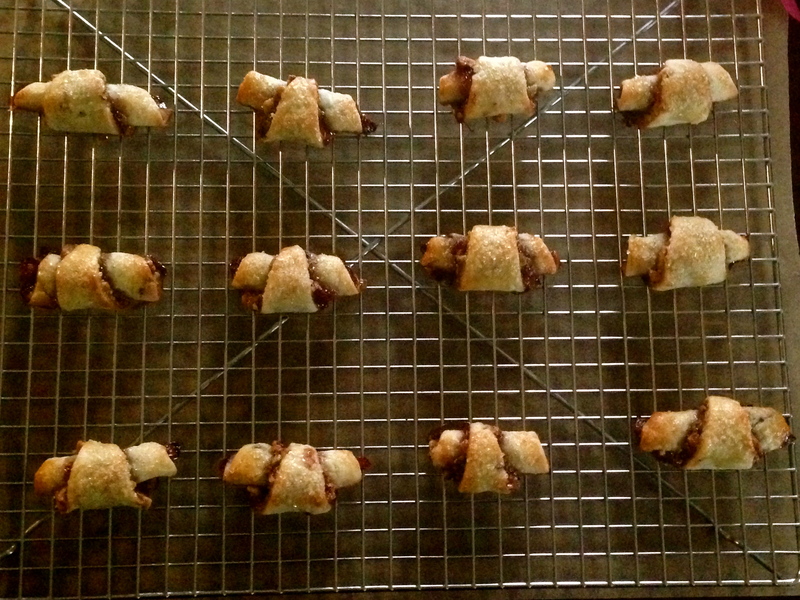 Place each rugelach on parchment lined baking sheet. Put in freezer for 15 minutes before baking. While they are in freezer pre heat your oven to 350 degrees. Bake for 15-20 minutes until golden brown. Remove to cooling rack. Extraordinary combination Suzanne! How wonderful those walnuts must taste! Enjoy the holidays, Merry Christmas! Thanks so much Viviana, oh yes the walnuts are really nice. They would be great on a salad also. I like the rosemary in the recipe! 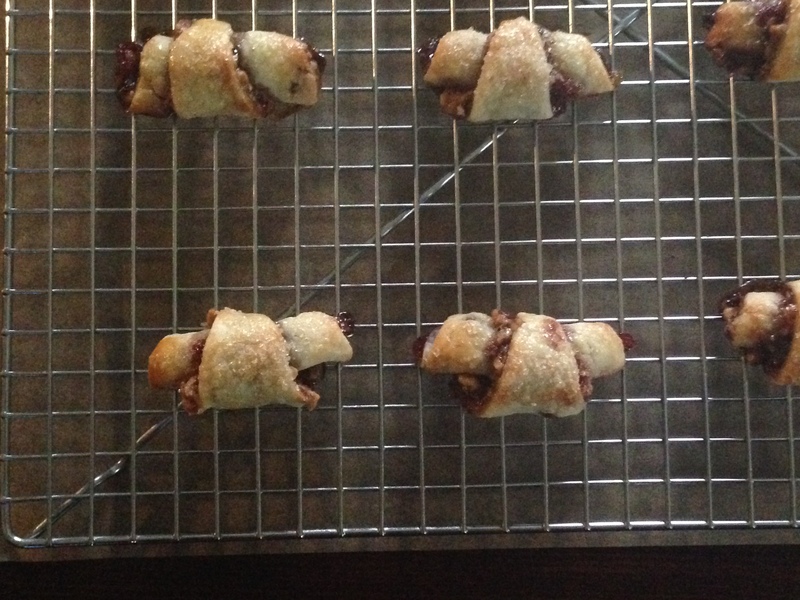 Rugelach is a family favorite here! Thanks Shanna, I wasn’t sure how the rosemary would taste but it’s very subtle and very nice. Happy Holidays. Absolutely wonderful-sounding combination. I can almost smell them! You make some such wonderful things around the holidays… Happy holidays! Thank you so much and a very Merry Christmas and Happy New Year to you and your family. The pugs blow kisses to Hugo! Thanks so much Uru, a very Merry Christmas to you! Looks pretty nice and seems easy to do ! Thanks so much, yes they are very easy to do and they can be tailored to your taste or go with the traditional flavors. Happy Holidays! Happy holidays too 🙂 I was wandering… Do you know if the 3 other pastry balls can be frozen ? I may try to do it (in order to finish a apricot jam) these day ! Yes they can. I never make all 4, as a matter of fact 2 are in my freezer right now. Thaw in the refrigerator, it freezes beautifully! Rugelach is one of those things I always wanted to make but never have tried, thanks for the yummy recipe in advance! Have a great holiday! Thanks Pamela, you have a wonderful holiday too! I am learning all the time, would you believe I had never heard of rugelach before. Your combination of ingredients for the filling sounds delicious as does last year’s one of hazelnut and chocolate. Really, wow. They are delicious, little bites, not big at all but really loaded with flavor from the different fillings. I just made the hazelnut and chocolate and used orange marmalade, it’s really good. Thanks so much. I love rosemary, what a nice added touch! These look so delicious, Suzanne! Thanks so much Sophia, the rosemary is very subtle but you do know it’s there. It’s really nice with the plum jam. looks lovely and delicious 🙂 A nice counterpoint to all of the uber-sweet stuff we serve this time of year. Thanks Liz, uber sweet yes a real overload of sweets right now. Have a wonderful holiday! What a great combination of ingredients… mouth watering. Thanks so much Georgie, Happy Holidays! Roasting the walnuts with melted butter and rosemary is a touch of genius! Would never have thought of doing that, nor using that combo of flavours. Like you I’m not keen on anything with a robust rosemary flavour. Which is why I hardly ever use it these days. But that! Try and keep me from buying in a pack of rosemary over the next couple of days. As for the rugelach I’ve only ever seen them on blogs. Have never tasted them. So! Shall be trying these over Christmas. Oh, have just baked thee most delicious date and walnut loaf (tea bread) by A Taste of Wintergreen. Going to try and get photos tomorrow. Hope you’ve recovered! And that you’re well for these coming Hols. Thank you so much Johnny, I can’t wait to see the recipe for the date nut loaf. I will make that, I need to make some loaves. Merry Christmas hope you have a wonderful holiday! I’m certain they are exquisitely delicious but they are also so pretty and darling! Wonderful! Thanks Azita, I love little bites like these cookies. I have always wanted to make rugelach, but to this day, have never done so! 😦 Your look wonderful, and perfect for this time of year! Lovely!! Thanks so much Christina, happy holidays to you and your family! Thanks so much Laura and the same to you and yours! These look absolutely delicious! The combination of walnuts and rosemary sounds like a perfect match 🙂 Thanks for the recipe, Suzanne. I have never made rugelach before but I sure plan to do so now. Thanks so much Julian, yes the rosemary and walnut and plum is a great combination. It’s very easy to make albeit a bit labor intensive but totally worth it. Happy Holidays! Thank you so much Shashi, Happy Holidays to you and your family! Thanks so much Ayesha! Happy Holidays. These are my favorite. I eat them all year round! They are delicious, you are so right they are good any time of year! These rugelach sounds exquisite, sophisticated yet not overly stuffy or complicated. Wonderful! Perfect for the holidays. I love finding herbs in unexpected places and these are simply lovely. Thanks so much Kate. Me too, I love adding herbs into dishes (especially sweets) where they are not expected. I love the idea of making the same cookies each year with a different flavor profile. I love these three flavors that you combined here – sweet but not too sweet. Yum! Have a great Christmas, Suzanne! Thank you so much, yes I like to mix it up a bit, keep it new and get a little adventurous. You too, have a great holiday. Thanks for the reminder to make these. They are Myles’ favorite cookie from his childhood. And I love the idea of adding the rosemary. Plum is so great with herbs!! Yum!! Thanks Susan, Happy Holidays to you and Myles! These are so cute! and look really Christmasy delicious! I’ve never baked with plum jam, but this combination sounds so so yummy. Hoping you have the merriest Christmas Suzanne with friends and family there. Thank you I love plum jam and the combination is really good. You also have a very Merry Christmas with lots of fun, food and festivities! I love the look of these Suzanne and the fact that the fillings can be changed depending on the seasons or personal preferences! I remember seeing rugelach in a couple of places in New York (that was the first time I’d ever heard of it) – I look forward to trying your recipe! Wishing you a very happy Christmas! Thank you so much and a very Merry Christmas to you also! Rosemary flavored walnuts?!?! Oh goodness…I have to try that! These not only sound wonderful, but they look beautiful too! Mmmmmmm. Merry Christmas Suzanne! Merry Christmas Brandi, yes those rosemary walnuts are delicious, I was thinking of making more and just eat ing the walnuts plain, even sweetened they would be delicious. Thank you so much Francesca, I am a jam fan. Love all varieties wish I made more this summer. I had never heard of the combination of the plum, walnuts and rosemary but luckily it went together beautifully. Oh would love feedback if you do, thank you so much.